4 - 4,5..........Vello von Fürstenfeld. 4 - 5.............Kira von Romberg. SchH 3: 100-93-92 = 285 points. Wasko vom Binselberg passed the Erstkörung at two years of age with Körklasse 1A rating plus became German Show Champion and VDH Sieger. He lived to 7 years of age. 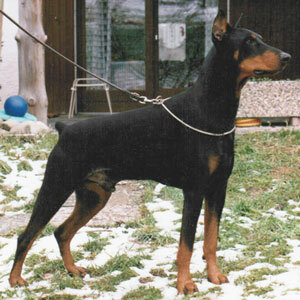 “This black male was a product out of a combination between two Dobermanns who passed the 'Körung'. In his pedigree we find more dogs who passed the 'Körung' like Satan von Ellendonk, Bronco vom Zenn, Jago von Beelen and Elke von Pfälzer Waldheim. Wasko also had a strong character with a high fighting spirit and a very high protective instinct with a lot of courage. Wasko passed the 'Körung' too. He earned his Schutzhund III title with the points 100-93-92. In conformation he did well and he became a German Champion. Wasko was a square built dog with strong bones. He had short strong back with a good tailset. His head was heavy with a powerful underjaw. His angulation was correct and he had a nice fore chest. His movement was O.K. Xira: dam of the vom Kloster-Kamp “F, K, M, O” litters.